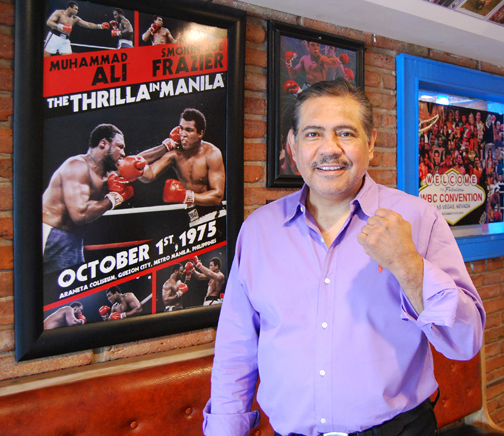 Ramon Arellano puts up his dukes in front of his restaurant, which has a boxing theme and displays memorabilia from his boxing career and the careers of his favorite fighters. “I’m old, man,” Ramon Arellano says with a self-deprecating laugh when I ask why he doesn’t tape up and pull on his gloves (“I make my own”) to take another crack at the sport that’s been his pathway to the American dream. The prizefighter pose – and the 56-year-old does it a few times while we talk about the life that changed from hopeless to hopeful in 1976 when he crossed the Rio Grande – illustrates at the very least the determination and the hard-fought dream that led to success as a businessman, prominent in the Nashville Hispanic community. He knows first-hand the yearnings that drive people from south of the border to take their riskier-by-the-day attempts to reach the land of the free and the home of the brave, just as he did when he crossed the river decades ago, vowing never to return to his dead-end life in Guadalajara. “I always knew I wanted to be in sports somehow,” he adds, recalling his goal when he took that swim, a potentially mortal risk so many still take daily. Some don’t live to get to the other side. Some are captured by Border Patrol agents. Many have been separated from their families, children and parents split up, shipped off to detention facilities and cages, dreams trumped by American politics and proclamations. “It’s sad,” Ramon says, searching for the words to describe his feelings when he sees this play out on TV news programs. Forty-two years ago, Ramon did make it to the other side, determined to prove dreams come true in the U.S.A. It took him a long time to achieve it, traversing hard years as a migrant field hand for $5 a day before finding enough success professionally and in the prizefight ring to reach this point in life where he not only is a boxing trainer for two of his sons but is running a boxing-oriented restaurant, nightclub and pool hall. “It’s just behind Hooters, off Harding,” he explains when I ask for directions to his large club on Wallace Road, in the bosom of Nashville’s Hispanic community. Almost reaching the ceiling are photos from his own career – he went 60-10 as an amateur and 7-2-1 as a pro – and other pugilistic memorabilia. “I fought as a middleweight. I was 5-10, 160 back then. I’m 210 now,” he adds, 15 years after untaping his hands and retiring his Arellano-designed gloves. Some of the photos show him in his fighting stance. Others are photos of his sons, Erick and Hugo, who both carry forward his dream by lacing up gloves and ducking between the ropes. Other photos and posters lining the entry hallway are tributes to some of Ramon’s favorite fighters, Muhammad Ali – “he’s still the greatest,” Sugar Ray Leonard, Larry Holmes. And then there are the real treasures in which he poses with those gentlemen at ringside. He leads me into the dining room, a wide hall filled with tables decorated with photographs of himself, his heroes and boxing mementoes. “To me, coming from nothing, to have the chance to hang with the biggest people in the world is a very big deal,” he points out as I cruise the room, examining the photos beneath the table-top glass. Even the stage is decorated as something of a half-boxing-ring, with rope and corner posts. The dancefloor, he notes, has been the site of some mighty fisticuffs “shows,” gloved battles he stages. “The dream lives,” he proclaims. He’s not just talking about the tabletops, but what they chronicle, the life sprung by the hopes that had him leaving Guadalajara to get to Ojinga, a dusty village in Chihuahua, where he dropped into the Rio Grande, bound for rugged land near Presidio, Texas. Ever since his feet hit the soil on the north side of the river, he knew he was where he was supposed to be, in the same land of opportunity sought out still by the pilgrims in the disturbing headlines. Sure, it’s a treacherous leap of faith to get here, but the U.S. remains the magnet of hope for immigrants attempting to escape dire straits by dodging Border Patrol guards and their dogs. “The United States is my country. It is my home. It is what gives me everything. Make my dreams come true,” says Ramon, who knows from experience why the tired, the poor, the huddled masses believe it’s worth the risk. And he laments that at least for some it has meant separation of children from their families, at least until that immigration policy was amended after a firestorm of objections from Americans who recognized the inhumanity of using kids as hostages to apply pressure and speed up the completing of the wall between nations. Ramon points out that Reagan’s 1986 policy allowed him to stay in this country, his dream destination, eventually to become a citizen. And he understands why others continue to line up for the treacherous gamble. “The dream lives to make your life better,” he says, using himself as an example. “I was very poor. I come from nothing, not even a pair of shoes. … To have no clothes, no money, (the way out) is to come to America. Everybody knows that in the poor countries. It paid off for him, and he encourages other young people, aspiring Americans, to walk that same line, to stay out of trouble, to work to contribute to society. He’s interrupted by a phone call from son Erick, who is 6-foot-1, 220. “He’s going to be the heavyweight champion of the world if God will guide us,” Ramon adds. His other son, Hugo, 5-6, 160, will be the middleweight champ, again with a bit of spiritual interference. 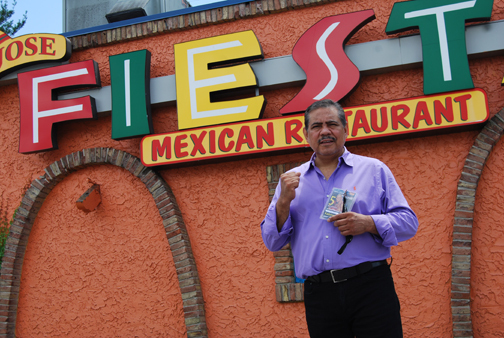 Ramon Arellano puts up his dukes in front of San Jose Fiesta, his restaurant and club on Wallace Road near the intersection of I-24 and Harding Road. Ramon – who has trained big-name fighters in a partnership with flamboyant Don King – is devoting his “free time” to help those boys climb the ladder of success. “I worked with Mr. King,” Ramon continues. “I trained three of his heavyweight champions.” Some of those fighters have boxed in this club. Ramon knows aspirations to wear the championship belt don’t necessarily come true. But he also knows that if the boys don’t reach those heights it won’t be for laziness or not trying. Ramon, who has 10 children from three failed marriages, explains he’s always taken part in raising his kids. But these two are his focus right now, as they carry forward the dreams that brought him here. He recalls how his late dad gave him the first leg up to a successful life by living well and working hard for his family. Ramon Sr. – the bar-owner’s father – was not hoping for boxing glory when he began to commute between Mexico and the U.S. on a work visa long ago. “We would only see him every six months or so when he would bring home the money,” the younger Ramon acknowledges. His dad didn’t get rich by roaming the States with other migrant laborers, picking oranges, turnips, strawberries and the like, but he was providing for his family. “I crossed the river in February in Chihuahua. It very cold.” His father had him tethered, so he could test the water’s depth before finding a relatively shallow place to cross the cold river. “It would be scary, but it wasn’t scary for me, because I was very excited to have a chance to change my life. On the other side, he and his dad walked for two weeks over the mountains of South Texas to find sanctuary and field work. Supplies included bags of sugar and of sugar mixed with ground corn. “When you needed energy, you put some sugar in your mouth. The sugar with the corn, well, the corn would expand in your stomach, make you feel full. Cause for celebration came years later, in 1986, when as part of an immigration reform package, President Reagan signed that bill granting amnesty to three million illegal immigrants. “That’s how I got my papers and I helped a lot of others get their papers,” Ramon recalls. Two of his brothers, Andrez and Nena, still run a family grocery in Charlotte, North Carolina. Ramon’s other jobs in Indy included working his way up a hotel’s management ladder – from housekeeper to executive housekeeper to restaurant manager to purchasing agent to beverage manager. All the while, he was building his reputation as a prizefighter. “Walking the straight line and boxing opened the doors” to his success. He understands, with reservations, the importance of border security and even the push for the wall. “That wall will help the United States keep everybody safe. But they will hurt people who want to do what I did, to come here to live a better life. He is reminded of how far he has come every time he turns on the news to see stories about the wall, about the immigrants, about the howling children separated from their hollow-eyed parents.